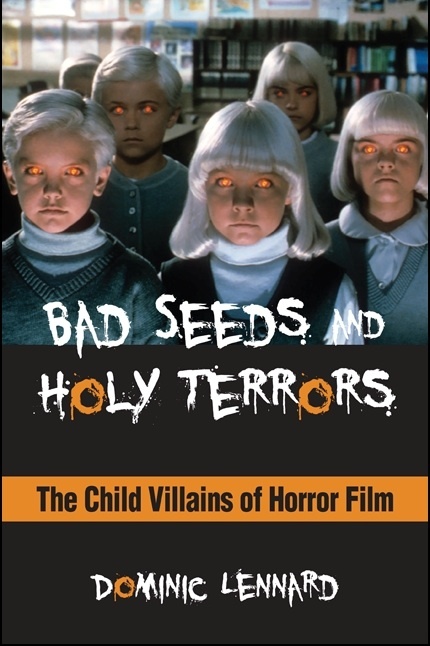 My book, Bad Seeds and Holy Terrors: The Child Villains of Horror Film (SUNY Press, 2014), has just been reprinted in affordable paperback and ebook editions and is available now from the publisher, Amazon, and anywhere else you can find it. The paperback is currently available for $24.95, and the Kindle ebook is less than $15. Professor Gwedolyn Audrey Foster (University of Nebraska-Lincoln), writing for CHOICE reviews, recently described Bad Seeds as ‘a bracing book’ that ‘more than does [its subject] justice.’ Please follow the SUNY Press link below to read more about it. Needless to say, I recommend Bad Seeds to anyone interested in horror film and this curiously popular subgenre; the book addresses questions like why these films emerged and why they’re frightening. However, it also uses horror (a conspicuously ‘adult-only’ domain) to explore a host of powerful roles and meanings adults have projected onto children in western culture — and how they malfunction. Anyone who does order: thank you so much for your support! I’m delighted to announce the publication of my book, Bad Seeds and Holy Terrors: The Child Villains of Horror Film, by State University of New York Press. The book is currently available in electronic form, and the hardcover edition will be released on November 1. This book wrangles with the numerous child villains who have haunted horror cinema over many decades, including Damien Thorn (The Omen), Regan MacNeil (The Exorcist), Samara (The Ring), and Rhoda Penmark (The Bad Seed), and the psychic terrors of Village of the Damned (pictured on the cover), among others. It interrogates in detail and with a variety of theoretical tools a cultural obsession with imagining children as objects of terror. In doing so, it highlights popular horror cinema as a vital topic of analysis, exposing it as a site of deep and volatile ambivalence toward children. Available in print and digital form from the publisher, SUNY Press; Amazon; and others.